are you a contractor...Or a Firefighter? If you're like most contractors, you spend the majority of your day putting out the fires your company set yesterday, with the knowledge that the fires you put out today are bound to pop up tomorrow. The bad news is this stressful pattern is going to continue until you change some things about the way your business runs. Maybe you're lucky enough to have a good size company where other people can work on things and deliver the products and services your company sells. If so, there are other people who can potentially help but they can't because no one is quite sure how you really want things done. In the meantime, you are killing yourself trying to do everything. What will your business look like in a year from now? What about five years from now? — Still working in every aspect of the business—instead of on it? — Unable to hire and train people up quickly to do things the company way? — Spending the bulk of your time answering the same questions day after day? Wouldn't it be nice to be able to get people up and running, doing their jobs properly, and making you more money within just a few weeks? Wouldn't it be really nice to have a business that could run without you? You can do all of these things and more with operating manuals. After working for more than 25 years in every facet of my family's plumbing, heating, cooling business, I sold my share in the company to my brothers and retired from the contracting business. I was able to do this and set my family up for continued success because I was so successful in implementing business systems and training people. By the time I was ready to go, the business was running so efficiently it could run without me. Today, I live in sunny Phoenix, with plenty of golf courses. And when it gets too hot in Arizona, my wife and I are free to travel. My wife and I are living our dream. We kept our promise to each other to retire from the rush of contracting before the age of 50, and to then help you do the same thing. WILL 2019 BE THE YEAR YOU FINALLY BUILD YOUR OPERATING MANUALS? My comprehensive operating manuals templates reflect 90 percent of what most contracting businesses require. All you have to do is edit—and that's a lot easier than trying to create them from scratch! We spent over $150,000 to develop the first edition of these operating manuals in 1996, for my family's Long Island, New York-based plumbing, heating, cooling, and now electrical business. Refined with hundreds of clients over the past 15 years, these manuals have been thoroughly road-tested and proven effective. There are up to 31 manuals available but you have to start with my three key integrated manuals—CSR, Dispatcher, and Technician. Why? Because they will change your business for the better immediately. There's more to operating manuals than you might think. That's why I've created this video tour, so you can see exactly what you get and just how complete they already are. That said, manuals are much more than just words on a page. They need to become a permanent part of your culture. That's why I created a detailed video course, to teach you how to do just that. My Build Your Operating Manuals Online Course contains all the information you need to successfully implement operating manuals at your plumbing, heating, cooling, or electrical contracting business. In this module, I lay out what to expect from the course, where these ideas came from, what's in it for you, and my "operating manual philosophy." In this module, I discuss three types of organizational charts you need to run your business—box chart, depth chart and flow of communications. I'll also explain in detail how they work and why they are important—even in small companies. Then I'll introduce you to the Triangle of Communications, involving the CSR, Dispatcher and Tech, which is facilitated by the three integrated manuals. 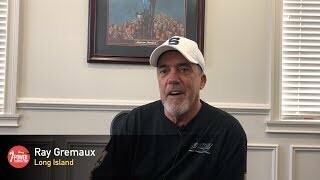 In this module, I cover the importance of picking someone to spearhead the project of building your operating manuals. I'll also walk you through exactly how to adapt the CSR, Dispatcher and Tech manual templates included with this course as well as what to watch out for. You'll learn the best way to go about customizing the manuals—complete with detailed video demonstrations of some advanced editing techniques in Word you can refer back to anytime. In this module, I will show you how to put the manuals to work in your organization the right way. Includes detailed rollout process, sample rollout speech, and do's and don'ts for how to introduce the manuals to your organization and what to do after the manuals are rolled out to ensure their success. In this module, I'll discuss what it takes to ensure the manuals become a permanent and dynamic part of your company culture. I'll also share some things to watch out for and how to use the manuals as a tool to correct unwanted behaviors. You have plenty of time to implement these manuals, right? No? You're in luck. In this module, I share my top tips and a (hopefully) inspiring story about how to manufacture the time you need to get these three key manuals installed—so your business can run with less stress and more success and you can shift your focus to working on your business instead of in it. You've rolled out your CSR, Dispatcher, and Tech manuals. You're already noticing things are getting better. If that's all you're after, that's perfectly OK! Just know that's there are 28 additional operating manuals available for purchase when and if you're interested. You already know how to edit them and roll them out! Just rinse and repeat. In this module, I explain what's available to you and what you might want to undertake next. To help you get the most out of the course we've created a comprehensive workbook outlining the key concepts of every single lesson. The workbook also contains plenty of space for taking your own notes. We encourage you to take notes because research shows that hand writing of new concepts helps anchor them into our brains better and faster. The other benefit of this workbook is that it serves as a quick reference guide if you need to refresh your memory on what to do as you are editing and rolling out your manuals—now and in the future. Simply download and print the PDF in Lesson 1, put it in a binder, and you'll be ready to roll! You'll learn about the three different types of organizational charts—box, depth, and flow of communications—it takes to run your contracting business properly. We'll walk through each type of chart in detail and I'll explain the vital connection between these organizational charts and the operating manuals you will be putting into place. If you're looking to make truck time more productive you can also listen to the course content on your digital device. Simply fire up your browser and go to our handy playlist. We'll provide the link. Note: Listening to the lessons is designed to enhance your learning experience from the videos and taking notes in your workbook, not to replace it! The Build Your Operating Manuals Program comes complete with everything you need to get operating manuals into place so you can run your contracting business with less stress and more success. 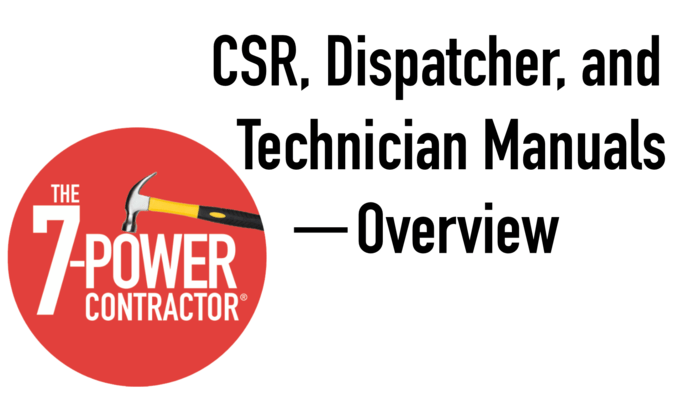 The three most important manuals for the key roles—CSR, Dispatcher, and Technician—90 percent already there. And they're easy to edit. The sample organizational charts that you need to manage your contracting business and provide career paths. right way to edit the manuals, get the buy-in you need, and how to keep them in the culture. A handy workbook and helpful handouts plus an audio-only version of the videos so you can listen on the go. PLUS the exclusive option to purchase even more of the manuals you'll need to cover the boxes on your Org Chart. P.S. To work directly with Al, you'd have to spend over $100,000 in a year. You can do this program from the comfort of your office (or home) for a fraction of the cost. I could go on for hours about how great these manuals are and what a big difference they have made in the lives of many, many contractors over the past 15 years. 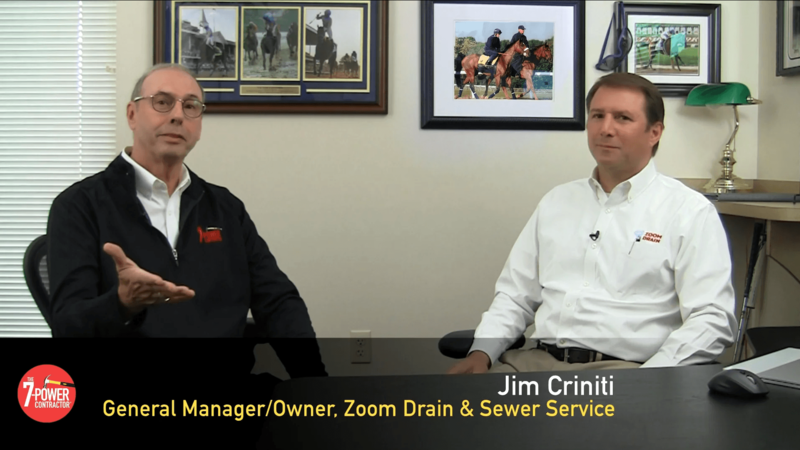 Watch this interview I did recently with Jim Criniti, Owner and General Manager of Zoom Drain Philadelphia. Zoom Drain is a prime example of the incredible power of operating manuals. 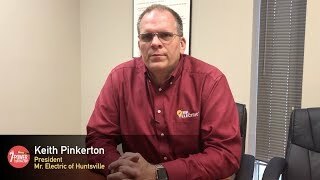 In this video, Jim shares the dramatic positive impact operating manuals have had on his company. Check it out. I'm not a plumbing, heating, cooling, or electrical contractor. Will this course still work for me? The principles are the same from contracting business to contracting business, the problem is that the manuals that go with the course are limited right now to residential and commercial plumbing, heating, and cooling, and residential electrical (commercial is coming soon). We may decide to offer manuals for additional industries in the future. To stay informed about new offerings, please join our mailing list. As long as you don't take delivery of the manuals, you can easily request a refund from your account page—if you do it within 30 days of purchase. Once you take delivery of the manuals or 30 days go by (whichever comes first) you can no longer get your money back. We say this a lot throughout the purchase and trial process, so hopefully the terms are clear! The good news is you get to watch the first nine lessons before you are required to make a decision! By that time we're hoping you believe in the value of the course and the manuals as much as we do. Where can I find my account? Look at the top of the page. You'll either see the text My Account or you'll see Log In. When you log in the log in button will be replaced with My Account and if you have purchased the course, a link to that as well. How can I access the Contractor Bookstore? You can only access the bookstore if you've already purchased the Build Your Operating Manuals Online Course and taken delivery of the three key manuals—CSR, Dispatcher, and Technician. The reason for this is that you need to go through the course to learn how to customize the manuals and roll them out properly for them to be effective. Are the manuals available for digital devices? The manuals are in Word and my clients are already using them digitally. They tend to distribute the manuals to their team with OneDrive, Dropbox or Google Drive so they can control access and editing by team members. How long will it take to get this done and into employees hands? How long is why I only get you started with the three key manuals that have the biggest impact on the companies that I’ve worked with. I know you’re busy. Normally, you need to dedicate two to four hours a week at a minimum to go through the course and get the manuals edited and then rolled out the way I direct you to do it. Are the trade manuals technical? There’s no procedure that is longer than one page. 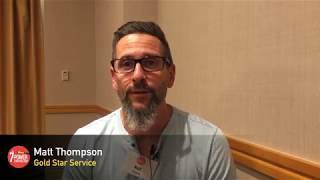 The goal is to get 10 Techs to do the procedure the company way vs. anyway they want to do it. The way they do it now is based on how they’ve been trained or not trained. It does allow 10 techs to go in and pretty much do the majority of the tasks in the plumbing, heating, cooling and electrical trades pretty much the same way. How hard is it to edit the manuals to fit my software? There aren’t a ton of key stokes in the manuals and although they’re written in ServiceTitan and QuickBooks everyone uses these softwares a little differently. My manuals have been edited to fit 35 to 40 different softwares over the years and it’s way easier to edit than to create something from scratch. Are there more Operating Manuals than just the CSR, Dispatcher and Tech? Yes, there are 31 different Operating Manuals. No company I’ve ever worked with has all of these. And for you this means you need to decide which of the manuals you need based on the trade or trades you do, whether you do residential, commercial or both and the size of your company today as there are key manuals that best fit larger companies as well. Note: To be eligible to purchase these additional manuals you must already have purchased the BYOM Online Program and taken delivery of the three manuals it includes — CSR, Dispatcher and Tech. You can see a brief preview of them in short video overviews and they are for sale in groups where there is some customizing in some of the groups and some groups are just the way they come packaged just like the first group contains just the CSR, Dispatch and Tech. Once you complete the initial course, you’ll know what you need to know to buy other groups and get them edited the right way and in at your company. Yes. The way it works is you buy the online program and start working your way through the lessons. In Lesson #9 you will be asked if you want to take delivery of the manuals. You must either take delivery of the manuals or request a refund within 30 days of purchase. To get a refund, simply click on the My Account Link at the top of the page in the black bar and go to Orders. Click the red View button and then click the Refund Request button. You’ll need to put in a reason (the real reason would be helpful but any text will do, the system requires you to write something). Click the refund button and your credit card will be automatically refunded. Remember: Once you take delivery of the manuals or after 30 days there is no refund. less stress and more success. Note: You will also begin to receive some helpful emails from Al Levi, The 7-Power Contractor. If you don't find them valuable, you may easily unsubscribe at any time! Great! We'll send you the cheat sheet! Ready to change your business forever?